*In partnership with The Sterling Companies. Located directly on the beach on Thomas Drive, Sterling Beach is the perfect vacation destination for families as well as groups or small corporate meetings. Sterling Beach offers spacious suites, 2-, 3- and 4-bedroom condos and amenities including a 4,000 square-foot free form pool, hot tub, gulf-front fitness room, private theater and meeting room, and club room. And with only 92 units nestled within 5 beautiful acres, you’ll always be able to find the perfect spot by the pool or on the beach. Sterling Beach is located nearby popular restaurants, amusements and shopping. Now Featuring FREE unlimited DVD rentals & FREE high speed internet access for all Sterling Resorts guests! Also, ask about our Local Area Attraction discount tickets. 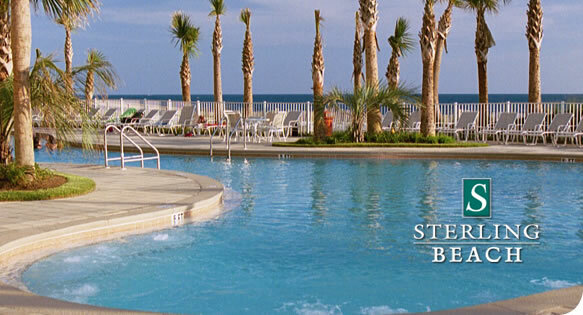 Sterling Resorts guests also enjoy complimentary membership in The Sterling Club at Bay Point. This club, on-site at the Bay Point Resort, gives Sterling guests exclusive access and discounts to the resort’s championship golf, marina, dining, tennis, and spa facilities. Guests also receive exclusive discounts at popular local attractions.